As the year winds down (when it feels like we might have accidentally reached in the dark corners of our closet and put on our ‘skinny’ pants when in actuality we are wearing our stretchiest fat pants) we start to see shows like “2016 Celebrity Scandals” and “Top 100 Sports Fails” on TV and we naturally start to reflect on the year that was 2016. I’ve seen Lots of memes on Facebook about the general terribleness that semi-adequately sum up the last 360ish days which tells me that lots of people out there didn’t have the banner year that they were likely hoping for when they rang in the new year at 12:00am on January 1, 2016. That’s life though right? We have good days and bad days, good weeks and bad weeks and we push through each bad day hoping to get to the next good day. That said, up until recently I had yet to have a “bad year” and truthfully, while lots of 2016 was a raging dumpster fire of a year, there were a ton of good days and great moments: I got to step out onto the ball field into the batters box and hear my team cheering in the dugout, we got to take June Carter Camper out for a couple of camping trips, I found out that my head is decently shaped, I got to help my dad on some projects that made me remember why we were such a great team when I was a kid and officially held the position of “dads helper”, I finished another 5 courses toward my never-ending degree and I felt an overwhelming amount of love and support from family and friends. Yeah, there was a whole bunch of crappy stuff and I could probably add “but,” to a lot of the good moments but I won’t because they shouldn’t be weighed down and made less important by the bad. 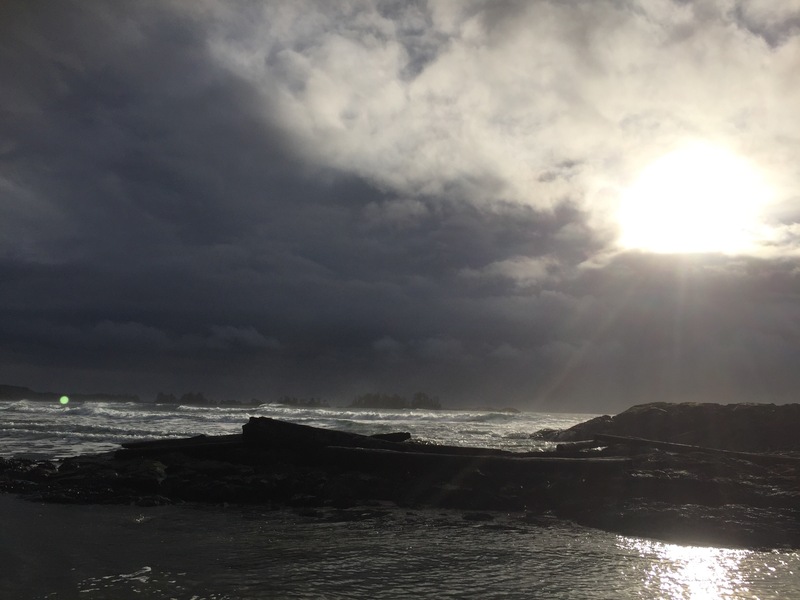 Tasha and I were lucky enough to get away for a few nights to Tofino in November (another 2016 highlight) in the limbo between the end of chemo and beginning of radiation. I had never been before and could have stood on Chesterman beach for hours upon hours just watching the waves and the horizon. On our last full day there we were at the beach throwing the ball for the dog and there was a rare moment of bright sun and blue skies. I stood there looking past the surfers at the next storm that was slowly rolling in. The clouds were darker than the ones that passed earlier, you could see the mist of rain in the distance and the temperature was changing quickly. Finally, the clouds fully rolled in, blanketed any slivers of blue sky and a few moments later raindrops started to fall. Taking it all in (in arguably the most beautiful place in the Province), I couldn’t help but see the connection. Life is a series of storms and sunshine. There are cloud bursts, long stretches of sunny days, rainy grey weeks and from time to time there’s those big, thunderous, violent storms. The weather is coming and changing whether we like it or not so the only thing we really have control of is how we handle and manage it all. The sunny days are easy, put on sunglasses, smile and soak in the warm rays. Then, When a cloud burst shows up we run quickly with our shoulders shrugged to try and stay as dry as possible. Some storms are easy to walk through, we grab an umbrella and press on, strong as ever. And Other times you have to hunker down and do everything you can just to weather the storm. There’s been more storms for me than ever this year and some have required battening down the hatches. At times I felt terrible, didn’t have the energy to talk to anyone and shut out the world. Other times I surrounded myself with friends and family, made the most of the days I felt decent and wrote this blog to try to find the humour in it all. It’s a year that has seemed like one storm after another rolled in and to say it’s been tough is a huge understatement but as the new year approaches I can see sunny days in the distance. You never fail to inspire me Arielle. Still hoping to be you when I grow up.